I finished this off before I left on my trip home. I love how it turned out, the colors remind me of ice cream flavors. I timed how long it took me to quilt it with a medium sized stippling….1 1/2 hours (including snack breaks of course). Not too shabby considering I had to re-wind my bobbin four times. Now if I could only figure out a faster way to baste the quilt….preferably where I don’t have to do it at all. The backing is the Alexander Henry Apples and Pears. They are so cute, I haven’t used them in anything for myself yet since they are very girly, but with this it matched perfectly. And I had it already, which is always a plus. WOW! I LOVE it… especially the back. So cute! I love your use of colors together. Beautiful! LOVe, love, love it! Allison! It is soooo cute! I really do like all the little squares. The white sashing just sets it off perfectly! Now I want to go do one too. :) Thanks for the inspiration. I always enjoy looking at your work! OOOPPS! Forgot to say that the back is PERFECT! Love it! Hey I did my first stippling on a table runner this weekend. I used Objects of Desire and it turned out really cute. I was so excited about doing the stippling I couldn’t wipe the grin off my face. WOW for you on doing the whole quilt in little over an hour! oh my heavens i love it!!! I love how your ice cream quilt turned out! Great choice for the backing too. I made napkins with that fabric, and just love it. Good to know about the timing for machine quilting, which I am on a mission to try this summer. LOVE it!!! Hope you dont mind, but im going to make one too. What a fabulous, relativly easy quilt to make. Oh and on the basting, im a tad naughty… i do it the very easy way. I use quilting adhesive spray, and spray my 3 layers together pushing all bumps out. It works fine and i dont get any bulges if im free motion stipling. However if i was doing a quilt with lines i would probably use a few pins too. I just find my pins always come out, or move around, or leave holes and i hate the time i waste doing it. Beautifully done. It definitely reminds me of spring. And nice choice for the backing. I too would like to avoid the whole “binding” part…I have machine stitched both sides of a binding before…it didn’t turn out that great so I dropped that idea and resorted back to the conventional way. But I have seen others done and they look great. I love it. I have you in my sidebar and am always happy to see a recent post from you to see what new project you have finished. I love your work, your ideas, your colors, everything! Hope you don’t mind if I use you as inspiration for my own creations. Good work! As usual you blow me out of the water. I need to stop checking your blog so early in the morning, it just makes me want to stay home and quilt! Beautiful. I’ve been meaning to start something like this pattern and seeing yours makes me all the more want to! Great job. You chose a perfect name for this quilt! I love it. You have such a great eye for color- and you are so (sew?) quick! I just love your blog. I find a lot of inspiration here so thank you! The back is perfect! And I love the green binding too. What a great quilt! Love how it turned out! So cute! I use basting spray on my quilts. It holds the layers together beautifuly, doesn’t gum up my needle, and it is SO fast! Love it! Love those apples and pears. I think it looks like my grandma’s quilts from the 40’s, not the fabrics, but the lots of white, lots of quilting and 16 patch thing. Beautiful!! I love all the colors and the way you have put them together :) Your quilting looks great – I love how fast stippling goes. I love it! Your quilts are so cute! Love it! Makes me want to cuddle up on the couch with that quilt & a bowl of ice cream! my goodness how on earth do you find the time?! maybe when I graduate in december I’ll be able to do more than a couple of blocks a day. Love the colors! They are great and the backing is perfect! I have issues basting my quilts too, it drives me nuts!! I wish I could figure out a way to do it that was easier! How do you baste yours? As far as basting goes, I cheat and use the spray. Bad me, I know. But I haven’t had any issues with it gumming up the needle – so far, so good! Such a beautiful finish, and the back is adorable! i love this. great backing and beautiful top. i love this one! the backing is one of my favorites. great work. Gorgeous! Beautiful colors, backing, and quilting–you rock!! Yum! I love those fresh colors! Well done. 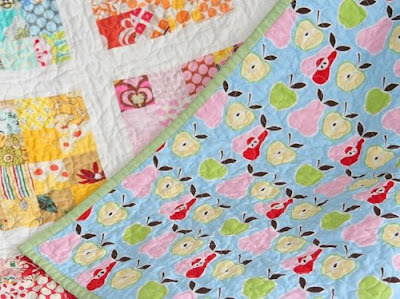 I am still too chicken to get my free motion quilting going… Thanks for showing us it can be done so well! I love the new quilt! I swooned when I saw this. Colors and flavor no less than delicious. Just had to stop by and say this quilt is absolutely beautiful!! WOW! That is so awesome, the reward for cutting all of those little squares! Beautiful work. beautiful–yes, ice cream, summer, the lake, a picnic. . . all those things come to mine. really beautiful work. I love your binding choice. It really frames the ‘scoops’. The value changes in the color blocks definitely gives the texture of ice cold ice cream. All your great comments have also given me some other quilt blogs to check out. I am so phsyched! Hope you enjoy the trip home. Oh it is just so beautiful!!! Wonderful!!! Glorious!!! okay, so last week I saw your post of the quilt top and I HAD to make one…I am almost done with my quilt top but it is going to be at least 42 colored squares…I am addicted. Sorry to be a copy cat! I just loved it and already had a lot of the same fabrics. I’ll post some teaser pics on my blog later today or tomorrow if you want to see my version. I couldn’t wait to see what you chose for the binding and back. Green was a good choice! 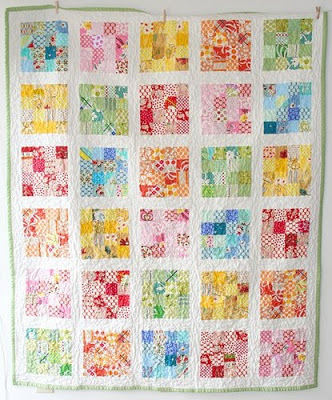 I think I have the same material for the back, but I also have Alexander Henry’s juicy (lemons) so I think I may use that since it is in my yellow blocks!!) Thanks again! I already have my next quilt in my head and can’t wait to get started (string quilt). This sure is addicting, isn’t it?! Just beautiful! You are right about it resembling ice cream. Just perfect for warm, summer-y weather! i just love it! the backing fabric is a wonderful choice. how large is it? That is so beautiful! Nicely done! Just peeking through you finished quilts and spotted this one, it's beautiful! I love patterns with simple squares! Loving the colors as well, so summery! Do you know where I can find the pattern?